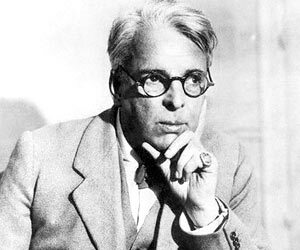 Yeats was born in Dublin 1865 but died in 1939, his poems are mostly of war like this. “An Irish Airman Foresees His Death” is a poem with end rhyme of ABABCDCD pathern. The poem is one stanza, with simple language, a worry mood and a sad tone. There are figures of speech like oxymoron “this life, this death” repetition “waste of breath” “kiltartan” alliteration “balanced all, brought all” “cheering crowds” personification “nor law, nor duty bade me fight” Antithesis “those that I fight I do not hate/ those that I guard I do not love” metaphor “A waste of breath the years behind” paralelism “My country is kiltartan’s Cross/ My countrymen kiltartan’s poor”. There are themes of shaky patriotism, risk in delight, pessimism, fate, etc. The poet found reasons that surpassed the act of patriotism, he realized that the only thing that kept him going through the war was just the delight of flying a war jet. “A lonely impulse of delight/ Drove to this tumult in the clouds”. He figured out that what he delighted himself with, will lead to his death but the fun of flying the fighter jet did not allow him to stop. Line 1-2 and 14-15, showed how strongly the poet’s pessimism had grown. He was so certain that flying will bring him death because no meaningful reward was in it where the past years were waste of effort and the years to come would bring no reward for flying fighter jet. He had no better choice than to resign to fate.